Thanks to Lisa at http://lisareadsbooks.blogspot.ie/ for giving me this book to review for her blog. This novel is mainly about two characters: Fitz, a 25year old barworker/DJ and his girlfriend Saffy, an art student. After meeting at a party, they are drawn to each other and very quickly move in together. However, Fitz discovers Saffy has issues. Drink, drugs and an eating disorder are all symptoms of deeper problems. He is slow discovering these issues though, as he is completely blinded by his love for her. When the seriousness of her addictions begin to threaten Saffy's health, and even her safety, Fitz feels he has no option but to call for help. Saffy's side of the story interlaces with Fitz's and the reader can see how she has many problems that are spiraling out of control. Her dependence on drugs reads as a dark and dirty place to be, and her problems surrounding food are causing bouts of OCD. Basically, she is drowning and cannot see anyway through the surface of her despair. Rehab has not worked for her before, and she describes being force fed and being watched as she visits the toilet, but with no happy ending. When she sees that she may have to return to the rehab centre, she runs away. As with the drink and drugs, running away seems to be her only way to escape. Saffy's family clearly do not see any light at the end of the tunnel and when her sister Jelli, talks to Fitz about her, this is when he questions if he has made a mistake by asking for help.
" "Don't get hung up on Saf. She lives on her own planet most of the time,"
"Find yourself someone new, hon, without issues. Saf's sweet but she'll always put herself first, it's just the way she's wired." The ache in my chest grew bigger and bigger and my hands and feet felt itchy and I realised all of a sudden that the Saffy her family knew wasn't her - maybe it was a her they'd just made up to explain it all away but whatever it was, it wasn't her. My Saffy was the real Saffy, and I knew her better than any of them ever would and there was no way in hell I was letting her just leave or be alone or be afraid. " 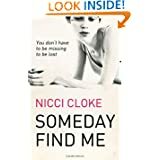 Nicci Cloke has written an in-depth look at love which knows no judgment. Fitz is just blown away by Saffy and will do anything to be with her. Saffy, while adoring Fitz, is just too far gone in her depths of darkness to see how much he wants her, how much he can help her, how he can try to fix her. It is a harsh read, with some very dark moments. The scene where Saffy's mother is force feeding her is heartbreaking. Another where Fitz tried to make her eat an apple is also disturbing. However, we can't ignore the realities in this world and this book is as real as it gets.